In our last newsletter we discussed the fact that the news anchor, David Bloom, had developed a Deep Vein Thrombosis (DVT) which broke loose and became a Pulmonary Embolism which took his life. David had many risk factors such as prolonged immobility, dehydration as well as long-haul flights to Iraq which probably contributed to the development of David’s blood clot. David had a silent risk factor which he did not know about. He had Factor V Leiden – an inherited blood coagulant disorder that can increase a person’s risk of DVT. Factor V Leiden is the most common inherited clotting disorder in the United States.This disorder is present in 2% to 7% of Caucasians, less often in Hispanics and rarely in Asians and African-Americans. It accounts for 20% to 40% of cases of DVT. Factor V Leiden is usually a hidden disorder, until someone in the family, someone who is athletic and healthy develops a DVT. Screening for Factor V Leiden is not usually done unless there are several members of the family who develop clots or one person develops several. Blood clots from Factor V Leiden can occur anywhere. The factor can increase the risk of heart attack, stroke, miscarriage, or gallbladder dysfunction. Just as it is important for you to know your risk factors for DVT, it is important for you to be aware of blood clots in your family history and their cause and wear your support stockings or support socks. 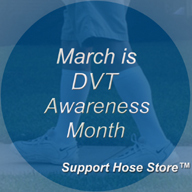 This is the last in this series of March is DVT Awareness Month. We hope you have enjoyed it. If you have missed any, they are all here on our blog, Ask Vanda just scroll down to view. We would love to have you leave a comment about a DVT you have experienced or about a risk you have from a factor deficiency.